July 20, 2015 By This post may contain affiliate links. Grill up some goodness this summer with 3 Perfect Pool Party Pizzas. Your guest will love snacking on Mediterranean Grilled Veggie Pizzas, a Veggie Pizza Fish, and a Fruit Pizza Watermelon. This post is brought to you by CollectiveBias and MorningStar Farms. 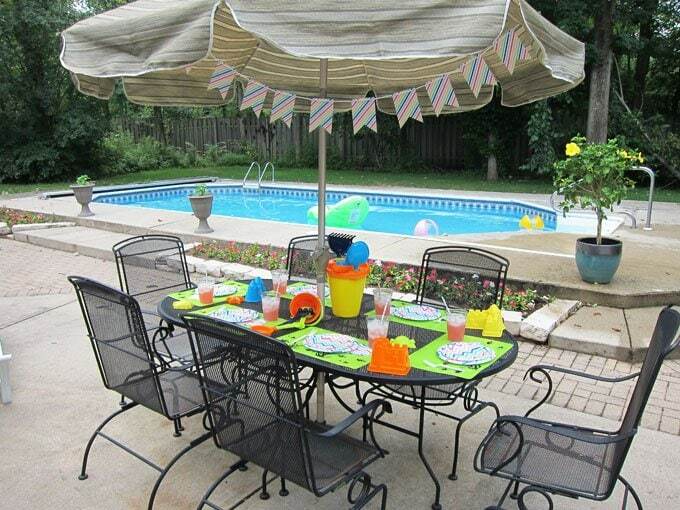 When the clouds parted and the sky turned blue on Friday, my friends and I gathered for a grill out and pool party. It was great to finally get to spend some time lounging by the pool. This summer has not allowed for many physical outdoor activities, aside from splashing in puddles and singing in the rain, so we all wanted to keep our dining options a bit healthier than normal. Instead of ordering pizza, we fired up the grill and made our own. 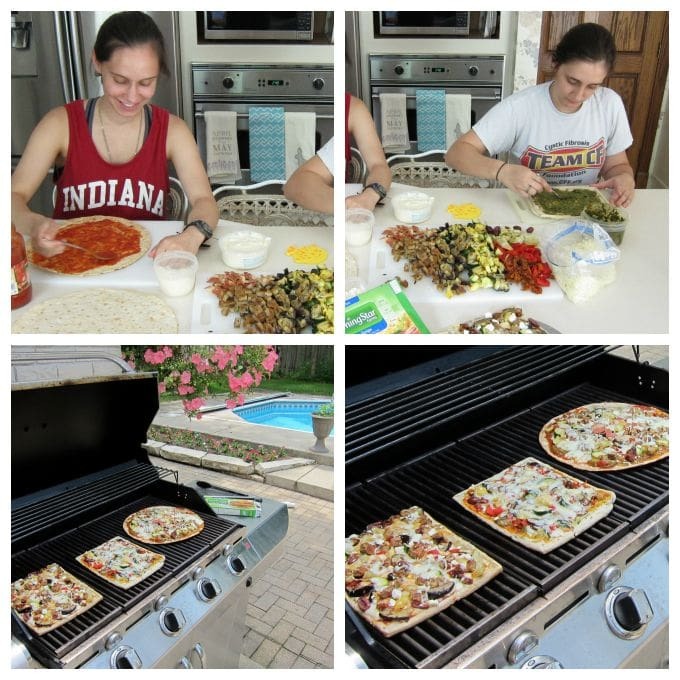 Last summer when we grilled pizzas poolside, I found that everyone really enjoyed topping their grilled pizzas with grilled vegetables, so that’s what we decided to make. To ramp up the flavor on the pizzas, we also grilled some MorningStar Farms Garden Veggie Patties and Veggie Bacon Strips, chopped them up and sprinkled them on top. I have been a huge fan of MorningStar Farms for years. My mom introduced them to me one summer when I came home from college and was looking for healthier lunch options. They’ve been a staple in my diet ever since. At the pool party I wanted to give everyone options taking their health and diet into consideration so I allowed everyone to customize their pizzas to their liking. 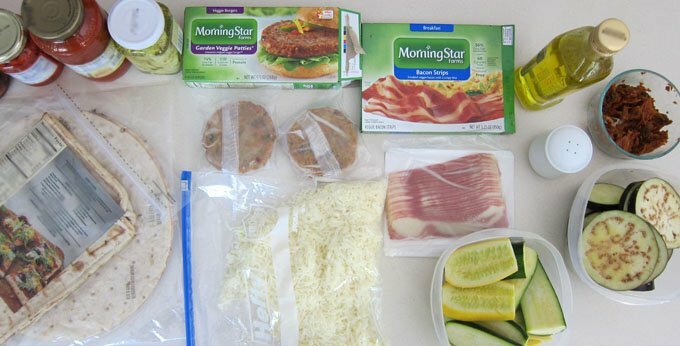 My friends had not ever tried MorningStar Farms products and I was happy to share. Everyone ended up sprinkling some of the Veggie Patties or Veggie Bacon on their pizzas and gave the veggie cuisine two thumbs up. 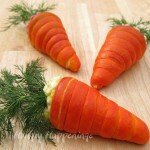 They are a big meat and potatoes kind of family but do enjoy an occasional meatless meal. One of the girls had just returned from a missions trip and had eaten and enjoyed a lot of vegetarian dishes. I told her and her family all about MorningStar Farms’ Veg of Allegiance program where you can pledge to eat a number of meatless meals each week. Not only is it good for you, but you can win some amazing prizes for taking part in the program. 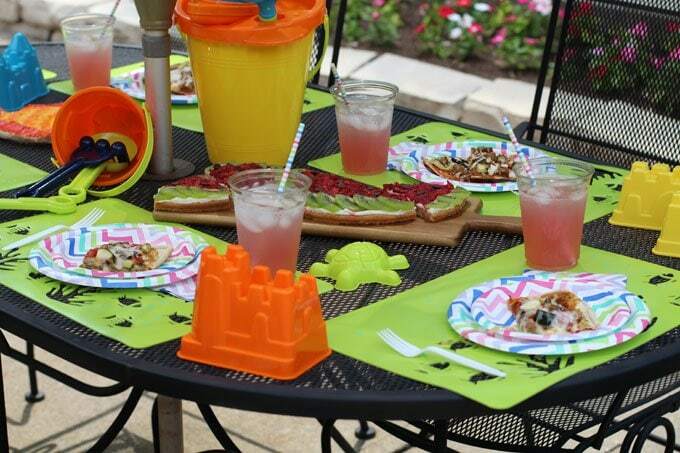 If you are hosting a pool party and want to make sure your party guests get to eat what they really love, you might want to consider putting together a “make your own pizza” bar like I did. 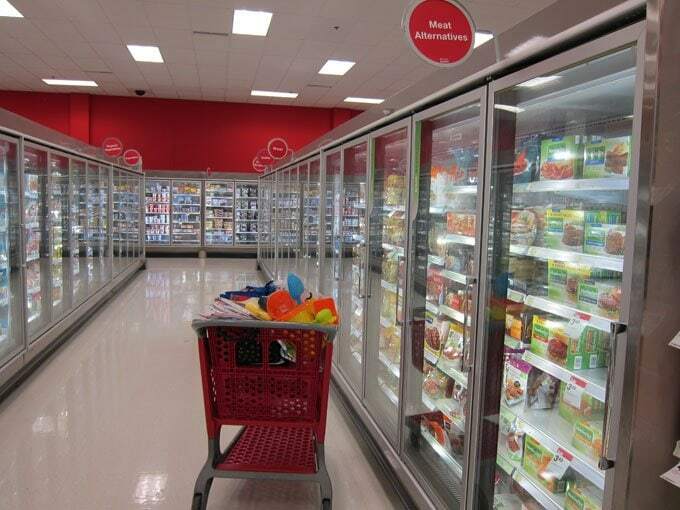 You can find everything you need to create a pizza bar at Target including ready made pizza crusts, three different sauces, loads of veggies, Garden Veggie Patties, Veggie Bacon Strips, and three kinds of cheese. 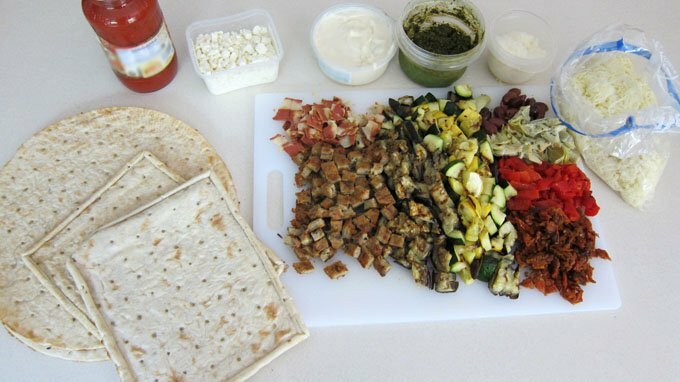 Before you have everyone create their pizzas you’ll need to fire up the grill to cook the Veggie Patties and vegetables. 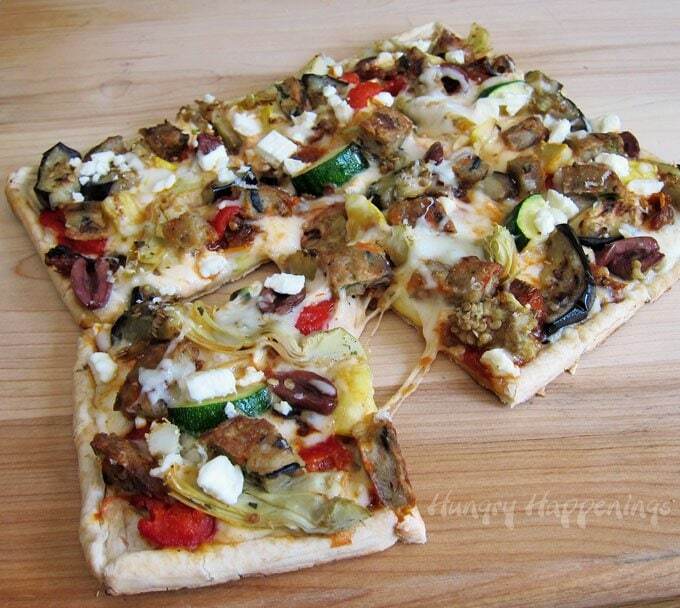 Toss on some zucchini, yellow squash and eggplant to make a Mediterranean style pizza. Chop up your grilled vegetables along with other meatless pizza toppings like sun dried tomatoes, marinated artichokes, kalamata olives, and roasted red peppers. Cook the Veggie Bacon according to the package instructions and chop it up too. Then let everyone make their own pizza creations. My Mediterranean Grilled Veggie Pizza was topped with pizza sauce, grilled zucchini, squash, eggplant, artichokes, sun dried tomatoes, roasted red peppers, Kalamata Olives, mozzarella, Parmiggiano Reggiano, and Feta cheese, and bits of Garden Veggie Patties which was fabulous. The zesty veggie patties brought out the flavor of the mellow grilled vegetables and were complimented by the sour notes in the olives, feta cheese, and marinated artichokes. It was my idea of a perfect pizza. Each party guest selected their toppings, then we grilled all the pizzas a few at a time. 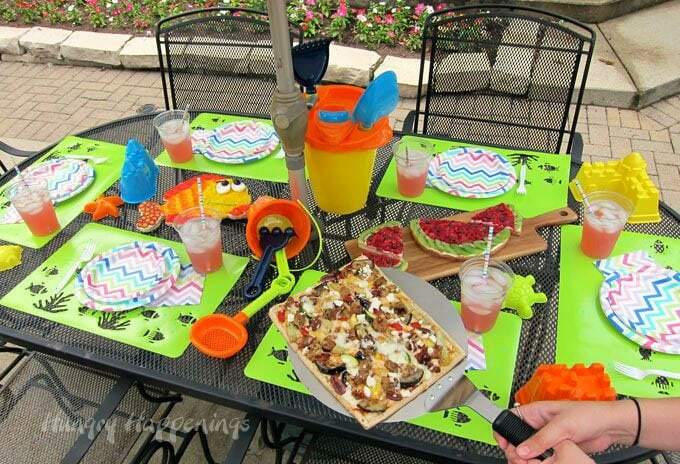 We all sat down to enjoy our creations along with two other fun pizzas that I had created that morning. 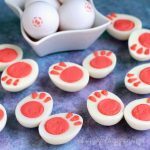 Being this was a party, I had to have some fun treats to serve along with our grilled pizzas. 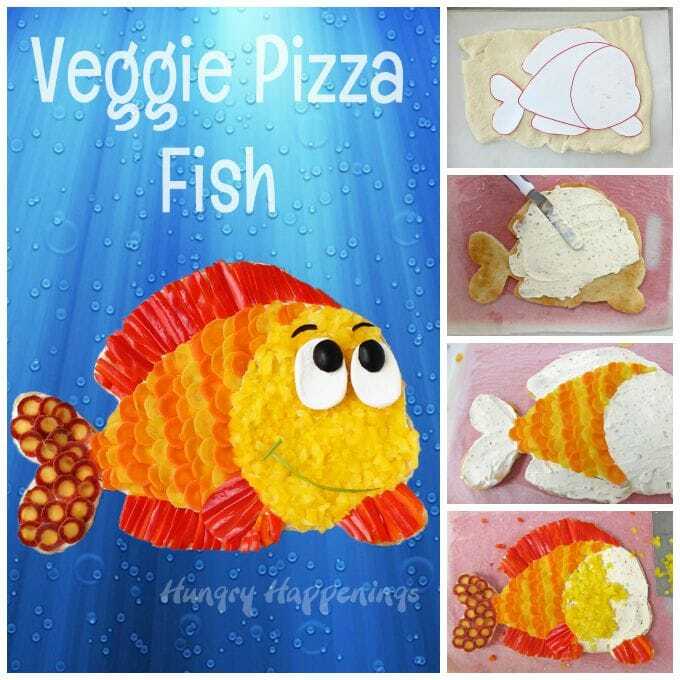 The party guests flipped out when they saw this adorable Veggie Pizza Fish. 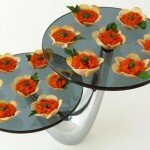 Not only did this appetizer taste great, but it really dressed up the party table. Oh, and it was pretty easy to create too. I shared the step-by-step tutorial and recipe for this Veggie Pizza Fish, here, yesterday. Check it out. After swimming we all enjoyed some refreshing watermelon. Well, it wasn’t exactly watermelon, but it looked like watermelon. It was actually a fruit pizza. 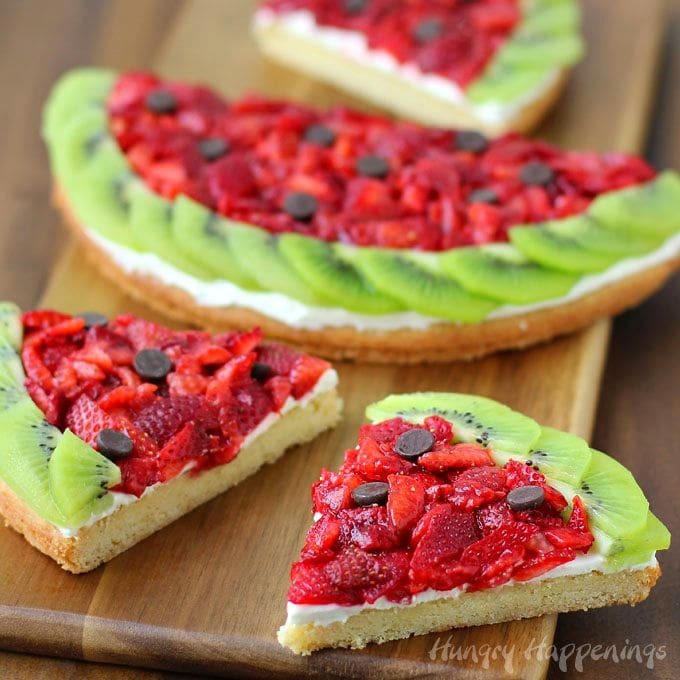 Be sure to check out the recipe for this Strawberry Kiwi Fruit Pizza Watermelon. All this food looked great on my festively decorated table. While shopping at Target I found a big set of beach toys which I set out on the table along with brightly colored paper plates, paper straws, and a banner that I found in their partyware section. The colors coordinated perfectly with my friend’s placemats. It was great that I was able to find everything I needed to throw this party together at Target being this was really a last minute gathering. I didn’t have time to drive all over town. 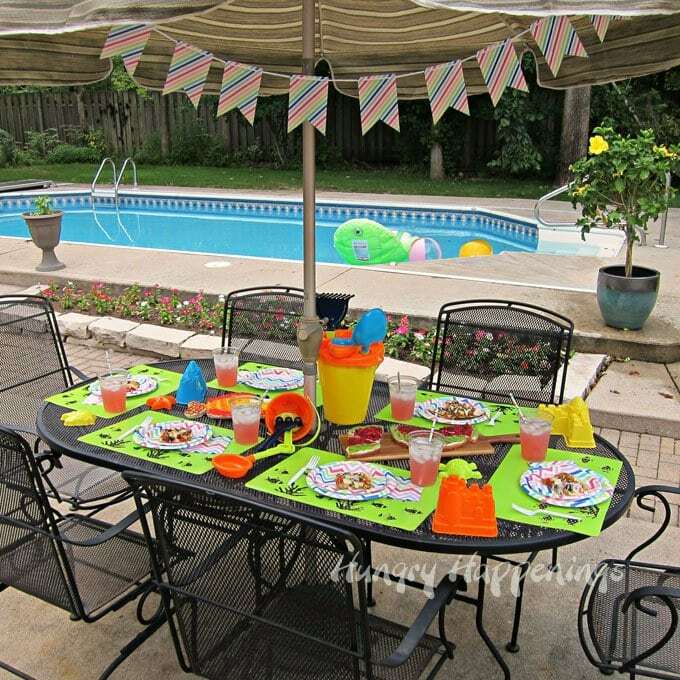 The decorations for a pool party don’t need to be elaborate. 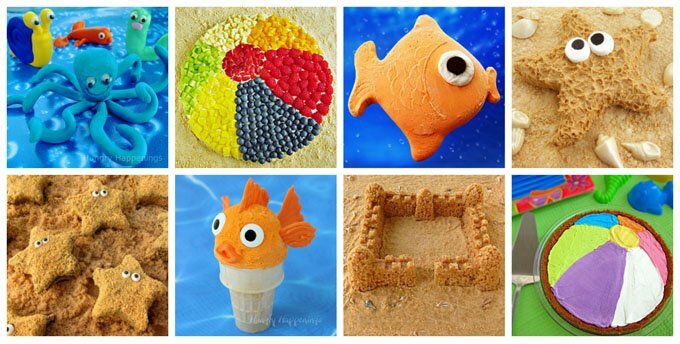 Simple and colorful work perfectly. Throw some pool toys in the water and you’re ready for an afternoon of fun. 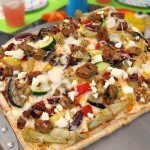 Grilled veggies tossed with bits of Garden Veggie Patties makes for a perfect pool party pizza. 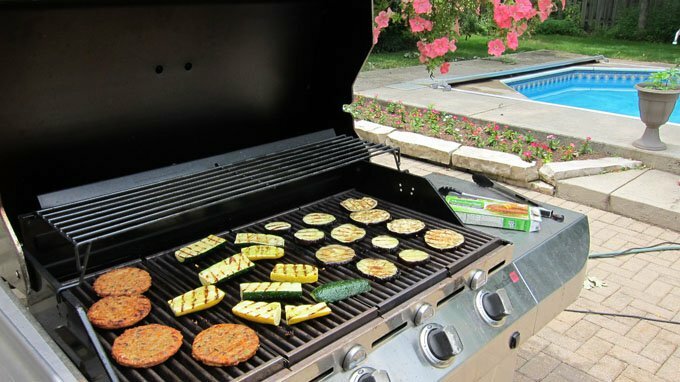 Grill MorningStar Farms Garden Veggie Patties until they reach an internal temperature of 165 degrees Fahrenheit. Reduce grill temperature to medium low. Top pizza crusts each with 1/3 cup of pizza sauce. Sprinkle 3 ounces of mozzarella cheese on each pizza. Top with vegetables, chopped Veggie Patties, and feta cheese. Grill for 8-10 minutes until heated through. I have been compensated by Collective Bias, Inc. and its advertiser to create and share this post with you. All opinions are mine alone. Up until this party, I had not tried MorningStar Farms products on a pizza and was happy I did. I will definitely be adding them to my list of pizza toppings in the future and encourage you to give them a try. I’d love to hear how you go meatless. Have you tried MorningStar Farms Veggie Cuisine? If so, what creative ways do you use them to add flair to your meatless meals? Can you fix the “facebook, twitter…etc” bar on your site? It is always in the way of your blog and I can only read from the top of the page. It is something new that has been done, as I never had this problem before. And your pizza’s look yummy. 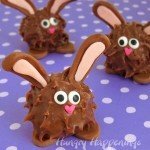 I think I will be doing this for a birthday party in 3 weeks. Thanks so much for letting me know, Genie. I appreciate your input so much. I just moved the floating bar. I’d love it if you could check it out and let me know if that is better on your screen. My laptop is really wide, so there was lots of room around it, but I realize everyone is looking at it on different devices. 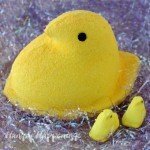 Looks like you had a lovely pool party – including the pool! I especially love that watermelon fruit pizza, it looks so refreshing, not to mention what a great idea it was! We really did have a great afternoon. 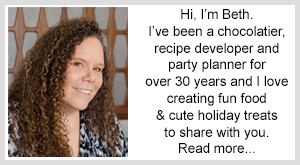 It was so nice to be able to throw a party together so quickly and as the host have as much fun as the guests. I’ll be salivating for the watermelon pizza until tomorrow. 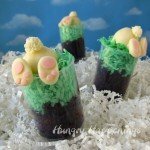 It sure does look like watermelon and, of course, chocolate chip seeds – YAH. So pretty with the fresh strawberries & kiwi. The pool looks so inviting. Lucky you to have neighbors with a nice pool/patio. Lucky them to have such a creative neighbor who whips up such wonderful meals complete with dessert. On the news last night was a video of a shark swimming only 3′ from shore at my favorite beach. No worries of that type with a backyard pool. 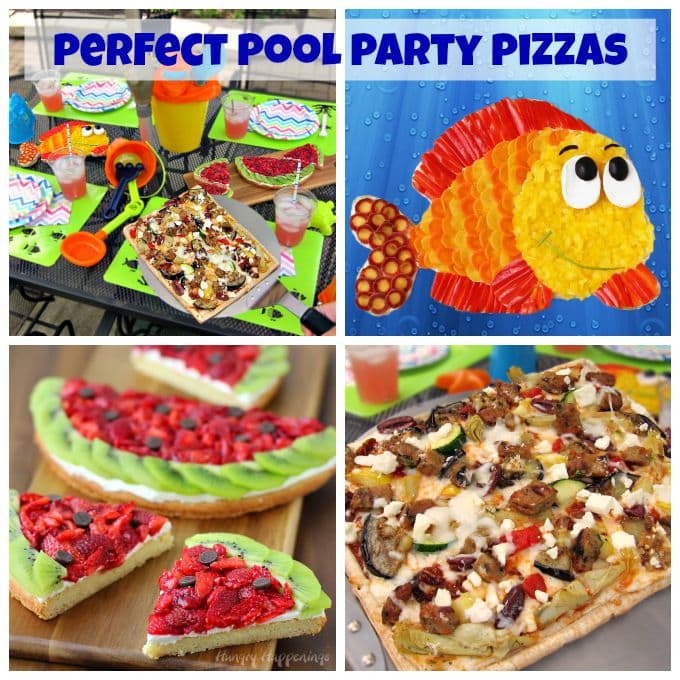 All of the pool party guests loved the Fruit Pizza Watermelon Recipe and really enjoyed making their own veggie pizzas. It really was a fun afternoon. The pool, sadly is not in my neighborhood, otherwise I’d probably be there every day the sun is out. It sure is a great place to hang out. I’d love to have a pool in my backyard. Maybe, someday! Earlier today, I watched a video of a shark attacking a professional surfer. He said he may never surf again. I hope to never run into a shark in the water, so I guess that means I better stick to swimming in the pool rather than the ocean. Everyone really enjoyed getting to add their favorite veggie toppings to their pizzas. It was a wonderful afternoon for all the party guests. Grilled pizza is the best! Thanks for posting. Hello from What’s Cookin’ Wednesday. Thanks for stopping by, Melissa. I totally agree. I am in love with pizzas cooked on the grill.